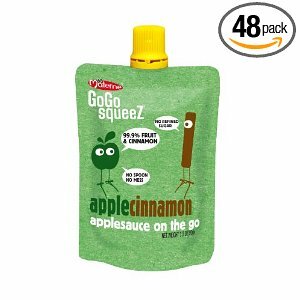 You can get 48 of these applesauce pouches for $24.90 and shipping is free. That works out to $.52 per pouch which is a pretty good price. These are so handy for quick snacks on the go or for lunchboxes. Plus they are good for you. These are all natural and contain no artificial flavors or preservatives. Each pouch equals 1 serving of fruit. Head over here and decide the flavor you want. Applecinnamon is the cheapest. Click the flavor you want and then click subscribe and save on the right side. The price for the applecinnamon is $29.29 and drops to $24.90 once you click subscribe and save. Your shipping will be free! Once your order arrives you just go into your account and click cancel subscribe and save. You can elect to not cancel and get regular shipments but note the price is not guaranteed to stay the same. I bought a Beaba Babypote to put applesauce and yogurt in. It’s silicone so it washes great and reusable for kids or babies. I can’t say enough good things about it. I love it!! We still buy these too to keep in the car and my purse for snacks. But for lunch boxes or when I know my kids need to eat something away from home I bring the Babypote. I got mine from babies r us. I’ve seen it on amazon as well.